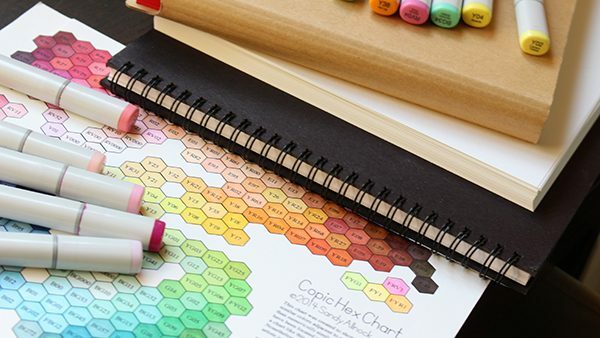 The Hex Chart is a digital download designed to show the visual color relationship between Copic marker colors. The ability to compare light tints of similar colors, or dark shades of them, is now at our fingertips! Purchase this item and receive a zip file containing two pdfs: one black and white to color in with your own collection of markers, and a color one to use for reference in making purchases. *Note that the color is only as accurate as your printer. 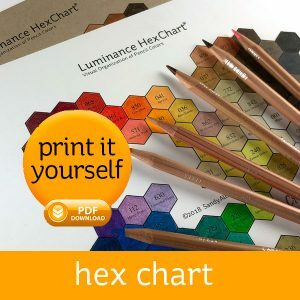 After purchasing the Hex Chart Bundle, you’ll receive a link in your receipt to download the zip file right away. 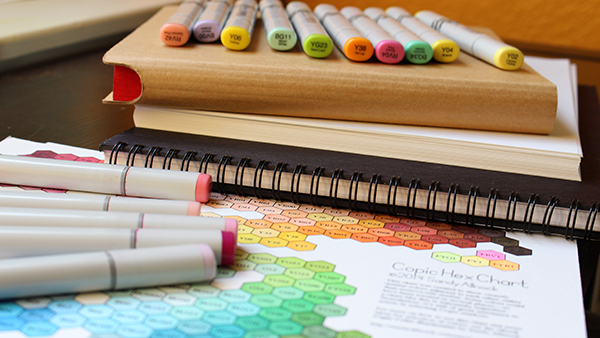 Unzip the file, and print the black and white on your Copic-friendly paper. (If you don’t have a printer whose ink won’t bleed, print it out and take it to a copy shop to photocopy onto Copic-friendly paper instead.) Hand color with markers you own. For dark colors, write the color number in a white pen. I love the chart. Is there a way to scale this larger to fit on more than one page? I have difficulty with the small print even using my bifocals and a magnifying glass. Looking forward to using this. It is a great idea. Just to the right of BG02 is FBG2. I assume it is meant to be BG72. You might have addressed this in the past but I missed it. Once again, thank you for developing a very useful tool. I’m wanting to purchase this chart but if I mess up coloring in the black and white copy can I print it more than once ? I have had your hex chart since October 2015 and while I still do not have all of the Copics, I reach for this chart every time I do any kind of coloring work. I love it. Since I’ve had them so long my charts have faded out (I keep them in page protectors , along with the lessons from your Copic 101 class, in a 1″ binder near my studio table for quick grab reference), and I am going to reprint them. It has been so long I cannot remember the types of cardstocks I printed them on. I know one was Neenah Solar White and another was Neenah Desert Storm, but not the others. I reach for this very often, one of my MUST HAVES! 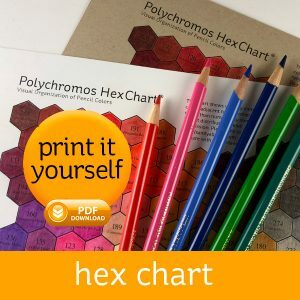 Love, love the hex chart! Now all I need is one for my prismacolor pencils!! Hint, hint 🙂 Thanks for all you do. 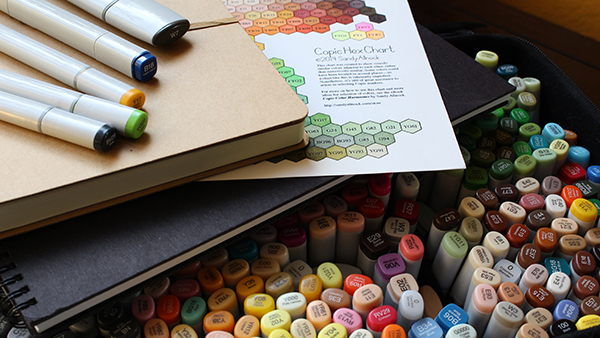 The Copic Hex Chart is THE MOST FREQUENTLY USED TOOL in my Copic art supplies! I refer to it constantly while working. It is worth the small cost (less than one Copic marker!) 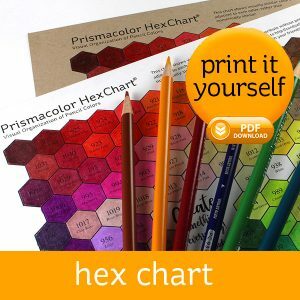 I love my personally colored chart – while making it I got to know my real colors better and I love the reference PDF of Sandy’s completely colored chart. The complete chart helps me know if I really ‘must’ have an additional color – I am not a complete set junkie yet!